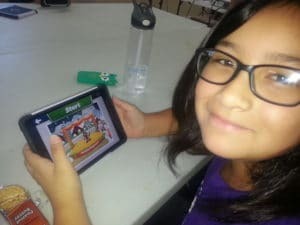 This summer, the non-profit organization dedicated to empowering Latina youth, Latinitas, provided themed media and tech camps for over 200 girls in Austin and El Paso, TX. 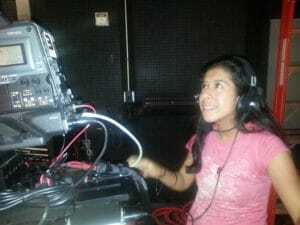 Latinitas taught girls what it takes to be behind the camera and in the editing bay, how video game design is coding, but is also art, theater and storytelling. Girls learned about media and technology’s role in the fashion industry and are also creating an “app for good” that had a goal of helping community. Every year, camp heavily focuses on media literacy and representation of Latinas at the media production and technology innovation tables. Villegas explained that she felt she could bond easier with the girls at camp. “I have been in clubs, but they are not that open as Latinitas. I can be myself.” Added Villegas. Selvia Nabo, also 14, said she enjoyed visiting Troublemaker Studios where Robert Rodriguez’s “Spy Kids” was created amongst other movies and television shows. In addition to field trips to Troublemaker Studios, area thrift stores for “thrift” fashion critiques and downtown boutiques for Latina owned business tours, Latinitas campers visited Austin offices for Facebook, Dell and Blackbaud, Inc to learn about creative jobs in technology and hands-on lessons in coding and game design. They learned what a quality assurance professional does, as well as participated in speed-mentoring activities where they interacted with dozens of women in technology. When girls weren’t out in the field, visitors came to talk to campers at camp headquarters about their jobs in art, film, photography, fashion design, technology, robotics, app development and more. Camp presenters like filmmaker Carmen Marron whose first film “Go For It!” housed “Jane the Virgin’s” Gina Rodriguez’s break-out role. Marron’s latest film, “Endgame” about youth chess champions out of Brownsville, Texas stars “Modern Family’s” Rico Rodriguez. Based in L.A., Marron skyped with Latinitas campers sharing her story from a family of 8 in Chicago to becoming a guidance counselor to self-training herself to be a writer, director and producer. She, like many of the camp’s professional visitors, bring with them their stories of success and challenges and provide Latinita’s campers with a model to aspire and relate to. Thirteen years ago, two University of Texas Austin students approached their professor about going off the syllabus regarding a final project in a Latinos in Media class. The outcome was the generation of the first and still only online magazine of its kind made for and by Latina youth: www.latinitasmagazine.org. The two students (who became Latinitas’ founders), Laura Donnelly and Alicia Rascon, came from different backgrounds, but their experiences made a great recipe for youth publishing and empowerment. Donnelly, an outspoken New Yorker had a decade of publishing experience under her belt. Rascon, born in Mexico and raised in El Paso, was coming from a production internships at places like at NPR’s Latino USA and an Americorps appointment tutoring in some of Austin, Texas’s most economically challenged schools. The two shared a fervor to combat negative stereotypes of Hispanic women and girls in cinema, magazines, news stories and other media. With some basic web design skills they created Latinitas magazine and with the help of classmates began publishing stories of real Latinas achieving academically and professionally, Latinitas magazine now employs an editorial staff and hundreds of youth contributors who also blog on Latinitas own social media: MyLatinitas.com. Latinitas is more than publications, though. A non-profit organization dedicated to empowering Latina youth using media and technology, Latinitas has provided direct digital media and technology training and esteem boosting services to over 3500 girls and teens annually, 20,000 through clubs, camps, workshops and conferences at 112 schools, libraries and community centers. Latinitas equips girls ages 9-18 of all backgrounds with lessons in the latest Web 2.0 platforms to design websites, produce video, record audio, blog, do photography, develop video games and apps and recently – code. 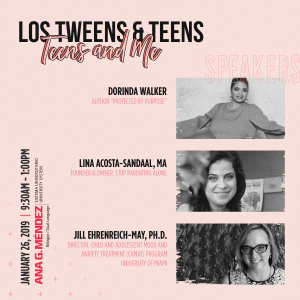 This entry was posted in Culture, For Teens, Raising Tweens, Soul, Technology and tagged latina teens, Latina tweens, Latinitas, Latinitas Summer Camp, summer camp. Bookmark the permalink.